Dalziel is at his best (or should one say worst?) in this novel. This is what earns the novel the one star. But - the story is too complicated. Don't get me wrong, I'm not a fan of the simple whodunits, but this is simply too much. Loads of characters involved is ok, but mixed with ever changing theories on who has done what and why with new ones around the corner every instant makes the whole thing disagreeable after some time. To finish it off, the recording is awful. The narrator makes a good job of creating a great personality for Dalziel with his voice and the accent, I have to give him that, but the weak and sick characters are definitely overdone. It's horrible to listen to him speaking in slow, hushed voices for ages, stopping at odd moments, making long pauses and then stopping again after a few words. That's not creating atmosphere or tension any more, that is simply annoying, and after some time boring. I just though "oh no, not again" when Cissy Kohler started talking again, was close to switching the thing off when the dying Westrop was involved. Worst of all is the sound quality. Most of the audiobooks I downloaded here sound like they were recorded on 1940s equipment, I am used to this already and have learned to live with it, but this one really beats the rest. It's ok on an iPod or iTunes, but it was impossible to listen to it on my navigation device while driving. And yes, I downloaded it it in the highest available quality. Even one credit was too much. i rarely give up on a bood or an audiobook, but here I had to - I just could not take it any more. Having listened to it for over ten hour, I gave in one hour before the finish. I just could not be bothered any more. 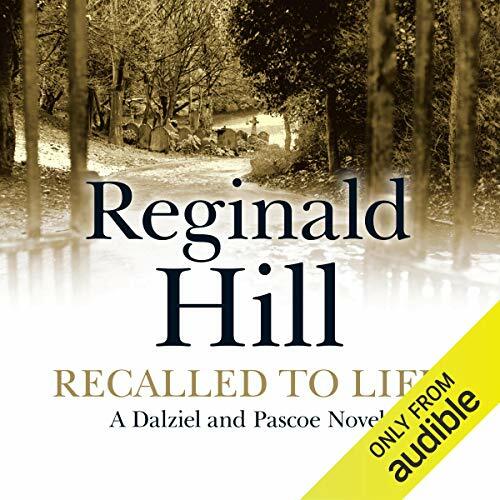 Would you try another book from Reginald Hill and/or Brian Glover? Reginald Hill yes; Brian Glover no. Although this one was VERY complex and could have done with some trimming, it was made worse by Glover's uneven narration. Yes, he does Dalziel's voice well (as he should), he is miserable with the women. Listening to Cissy talk was worse that just about anything I have heard in a while. He also raced through the non-dialogue narration as if he was being paid by the word. And raced in either a monotone or a sing-song. Pacing overall was very uneven. Already begun Vintage Murder by Ngaio Marsh. Jim Dale would be my first choice. Was Recalled to Life worth the listening time? I try to do series in the order they are written and this was next in line. It was a bit long, even though the story was complex and had characters sort of appear randomly, but I stuck it out anyway. My hope is that the next installment is better. Hill at his most complex and erudite. Read once for the story and will re-read to enjoy the language.